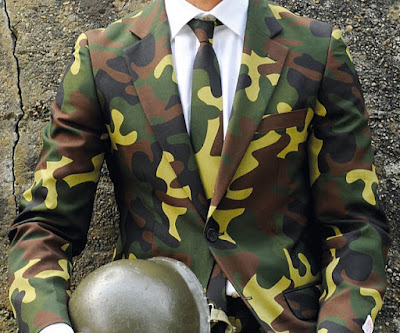 There's business casual, and then there's business camo. This seems like the kind of suit to wear when your company is doing lay-offs. They can't hand you your walking papers if they can't find you. This is something you can actually buy, by the way, but in truth I suspect rather than avoiding termination, wearing this might be a cause.